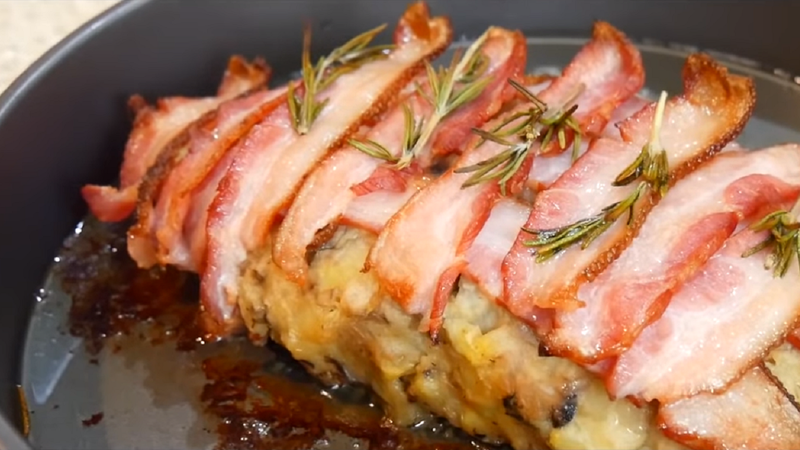 A few days ago, one of the most prominent ani-tubers out there, akidearest, put out a video attempting to replicate one of Food Wars!’s most iconic dishes: The bacon-wrapped mashed potatoes loaf of gloriousness, the “Gotcha” pork roast. A task like that, however, requires a recipe. Where could one get that from? Well, to the tune of a “DING,” it would be this! It really is no big surprise, either. In fact, it seems that at this point, Stanlick’s experiment-turned-recipe for the Food Wars! gotcha pork roast is THE definitive text on the dish. And from the looks of things—I have shamefully still yet to try making it myself, despite wanting to for years—it is more than well-deserving of the honor. The Takeout? Pffft, who needs them when everyone’s got AniTAY? And why would Aki turn to anything other than them for her own go-round?? Sure, it takes some major liberties with both the show’s rendition of the dish and the recipe instructions—it’s more of a bacon-topped loaf than bacon-wrapped, and where’s the wine sauce? !—but the foundation is clearly there. Through all of that, I cannot help but think about how weirdly cool this is. To my authorial brethren on the anime beat, congratulations!! You’ve made it! When’s HellthyJunkFood gonna take their own swing at it though.